The Who. The Rolling Stones. Pink Floyd. Elton John. David Bowie. Queen. Those four guys from Liverpool. For a small rock in the North Sea, the United Kingdom is responsible for a big number of the greatest rock bands of all time, all of whom left their own unique, indelible mark on music. And I humbly suggest that the exhaust note of the 2018 Range Rover Sport SVR deserves to be added to the list. There's a lot to talk about with Land Rover's $115,000 high-performance hammer, but it's impossible to say anything without first bringing up that sound. In Comfort mode, the supercharged V-8 burbles pleasantly through the quad exhaust pipes with minimal whine, an unplugged warm-up session before the main event. Then you put the SVR-tuned Rangie into Dynamic mode and press the magic exhaust button normally found on Jaguar F-Types, and those activated valves transport you to a sonic world you didn't know existed—a place where the noise being made by a 5,400-pound SUV rivals that of any spicy pizzo from Italy. You'll lose yourself in the crescendo; thankfully, the thing crackles and pops with force on the overrun, punching through the delirious haze like a gated reverb snare. There's no reliable way to transcribe the sound. It must be heard, felt, experienced. It alone is probably worth half the six-figure price of admission. And Land Rover has done its best to close the gap by crafting a true dual-purpose vehicle, one that's equally at home on a racetrack and a rutted trail. We've posited before that Range Rovers are the best SUVs in the world when you get down to it, so the Sport SVR should be the best performance SUV in the world. Honestly, it's damn close. Close because there are still a few nits to pick with Solihull's fastest. Some are subjective, like the awkward time I had using the Touch Pro Duo infotainment/climate control screen that does away with most physical buttons. But even in this era of globalization, I ran into more than a few classic British gremlins in various electronic systems during my weeklong test—almost enough to make me think twice about the price. Almost. At the end of the day, it's still a Range Rover, which means it's still a capable and beautifully aspirational rig that makes people stop and stare no matter what. The SVR's soundtrack just gives them more of an excuse. Mercedes has AMG, BMW has its M division, and Jaguar Land Rover has Special Vehicle Operations to take its vehicles to extreme, illogical ends. For the Range Rover, that can take the form of an luxuriant Range Rover SVAutobiography (soon available in a two-door body style), or the hard-charging Range Rover Sport SVR. The base Sport model has been updated for 2018 with a sleeker front fascia and integrated tailpipes; the wizards at Hogwarts SVO's new Technical Center in Coventry tune the chassis and add a more aggressive front bumper, a carbon fiber hood, and a rear spoiler to the proceedings. It's available in a variety of appropriately loud colors like Madagascar Orange and Spectral Racing Red Chromaflair, and an optional $5,200 Carbon Fiber package leaves the raw weave unpainted on the hood. All together, it's...not subtle. But the Santorini Black paint on my tester went a long way towards giving it the passing appearance of maturity, as would any of the ten thousand other shades of black on offer. And the way the exposed carbon fiber was only visible in direct sunlight was a cool effect. 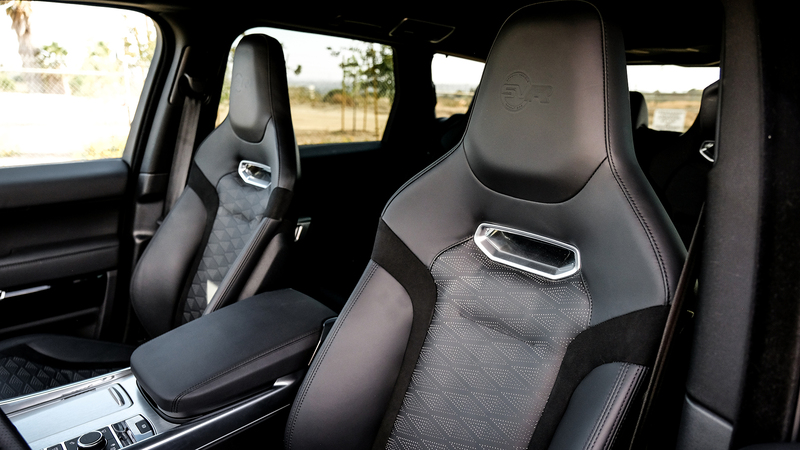 Classy is as classy does, and there's no mistaking this interior for anything other than a Range Rover. 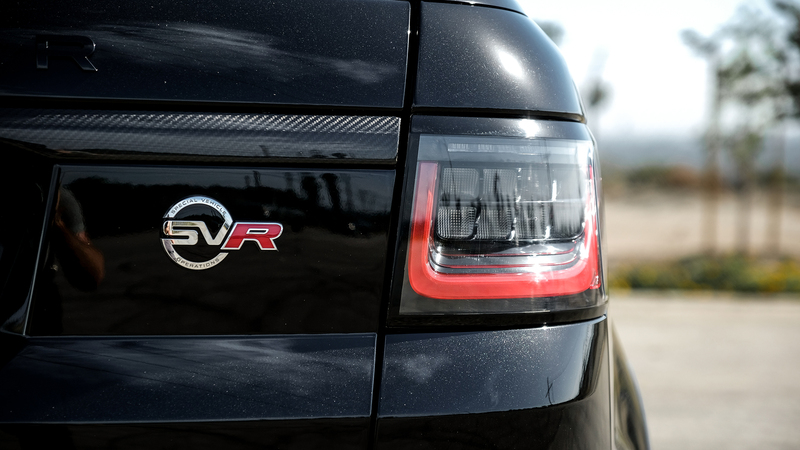 That means stylish appointments, quality materials like Windsor leather, and premium touches like touch-capacitive switches throughout, with understated badging and not-so-understated sport bucket seats giving the SVR model its own flair. 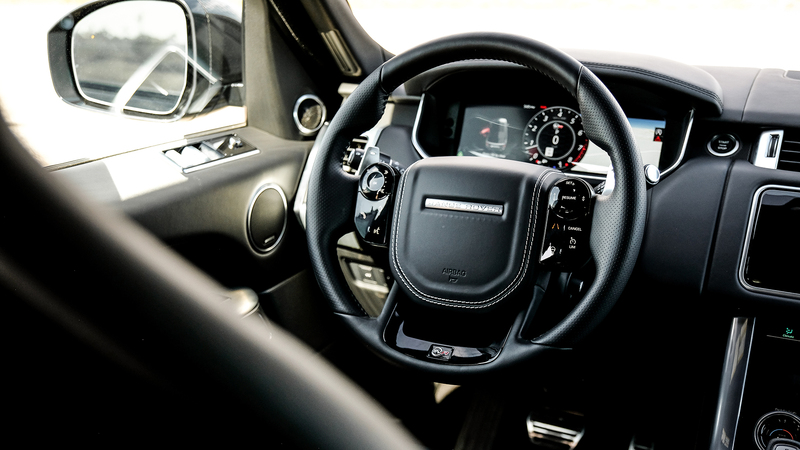 High-resolution screens abound; the gauge cluster is now fully digitized, and Land Rover's Touch Pro Duo two-screen infotainment system has taken over the center console. The 22-speaker, 1,700-watt Meridian stereo system sounds great, I assume (I barely used it, what with that sound out back). It all looks the part in theory. So why did it leave me a little cold? Part of it stems from the Touch Pro Duo interface, which looks beautiful and packs some interesting ideas but lags—literally—in execution. 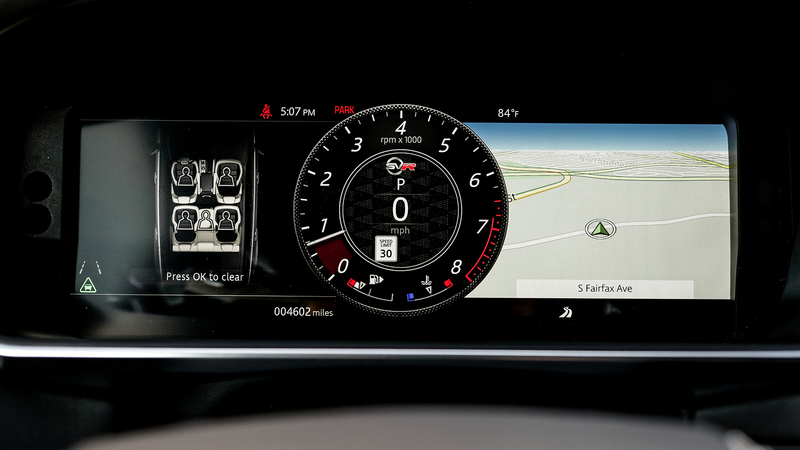 The top screen is a standard media/navigation infotainment unit, while the bottom one controls climate, drive modes, and other vehicle functions. It has two context-dependent knobs that control different settings depending on which menu you're in (plus a blessed volume knob), but everything else is touchscreen-based. It's awkward hunting things down at first, though there's bound to be a learning curve with any unique setup. A larger problem is that it's frustratingly slow to respond, as were the gauge cluster menus when using the steering wheel controls. It was in the bowels of Touch Pro Duo that I ran into my first electrical gremlin as well. Curiously, the Sport SVR would default to blasting the rear air conditioning at full strength when I turned it on, no matter how it was set in the front screen or the rear control panel previously. This was annoying because it was a.) loud as hell and b.) sapped precious cold air from the front seat occupants. Bringing me to another issue, the all-black interior. Solid black interiors look cheap and bland to me because they mute much of the design. But paired with the black exterior, it also absorbs a ton of solar heat. I left the truck parked outside all day as temperatures topped 105 degrees and hopped in around 5 p.m. to drive across Los Angeles. The interior was still uncomfortably hot after 45 minutes even with the A/C pumping. Then again, the sinister vibe works with the supercharged 5.0-liter V-8 under the hood. The venerable AJ133 mill has been stuffed into just about every Jaguar-Land Rover vehicle this decade, and it's also become the powerplant for outlandish projects like the Land Rover Defender Works V-8, the Jaguar XE SV Project 8—and of course, the SVR versions of the Jaguar F-Type and the Range Rover Sport. It's a tried and true solution to the problem of making things go fast. 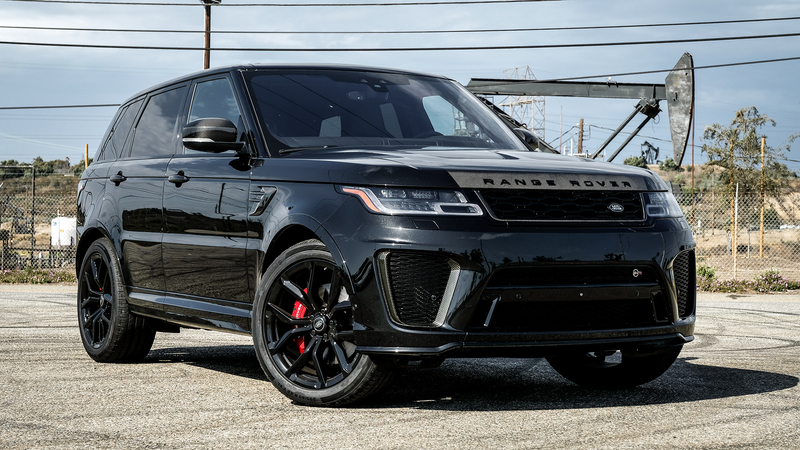 Yet the version found in the Range Rover Sport SVR benefits from some internal tweaks that make it the most powerful engine ever put in a production Land Rover. You'll enjoy 575 horsepower and 516 pound-feet of torque, delivered through a beautiful ZF eight-speed transmission that rarely misses a shift and responds to paddle inputs with lightning speed and a nice farty punch from the tailpipes. Another quick word on the adjustable exhaust: It uses active valves to create that split personality, with no artifice being piped into the cabin through the speakers. The magic overrun crackle can be activated on demand by locking the transmission into second gear and dancing on the throttle between 3,000 and 4,000 rpm. You could argue that's still faking it, since it's recreating the less-efficient character of engines past simply because it sounds cool. But then you'd be that person. Power flows to all four wheels with a default 50/50 front-to-back torque split that varies and vectors as you push it; being a Land Rover, low range and the company's Terrain Response multi-mode system are also available for off-road fun. What do those numbers mean in a truck that weighs 5,400 pounds? That the powertrain is able to scoot the Range Rover Sport SVR from 0 to 60 mph in 4.3 seconds on its way to a top speed of 176 mph. A decade ago, that number seemed laughably impossible in an SUV, let alone one that still has real off-road chops. How times have changed. The first time I shifted the transmission into reverse, a curious warning popped up on the upper screen: "Camera system not available." The Range Rover Sport SVR comes standard with a backup camera and a 360-degree surround view system, and neither worked. This persisted for a few drives until I raised the air suspension to its off-road height; after that, the backup camera mysteriously came back from the dead. The 360-degree system never did. None of this is really okay in a $130,000 vehicle. But the second you put this thing on a proper road—hell, even an open stretch of highway will do—you'll make any excuse under the sun for it. As I hung through the legendary curves of Angeles Crest Highway behind a pack of sportbikes, the camera snafu seemed a distant memory. The steering is heavy and direct in Dynamic mode, the exhaust bangs out an endless string of power chords, and the sheer force at your fingertips is straight intoxicating. It's the spell SVO has cast on the suspension that's most noticeable. The damping work limits pitch and roll during aggressive driving to an impressive degree without sacrificing ride quality, and around town in Comfort mode it feels like a normal SUV. But switch over to Dynamic, throw it into a curve, and it's clear the SVR is anything but. Sitting that upright position and gripping a wheel that reads "Range Rover" while hustling through spacetime at sports car speeds is a hilarious, hilarious time. The all-wheel-drive system still does work on pavement to keep you there, locking and unlocking the rear differential as needed to fight off understeer and moving torque around between all four wheels. It lacks the adaptive anti-sway bars found on other performance SUVs, so it's not quite as stable as, say, a BMW X5 M or a Porsche Cayenne. But the Range Rover Sport SVR schools the entire market when it comes to pairing actual off-road abilities with a trackable people-mover. Even on summer tires, the SVR Rangie is ludicrously capable when the going gets rough. It seems unlikely that many owners will take advantage of this, but 11 inches of ground clearance, a fording depth of almost three feet, whiz-bang gizmos like a low traction launch system, and a locking center differential prove a mighty combo on the trail. Just like its performance on asphalt, its off-road limits are far higher than its purpose-built appearance would have you believe. 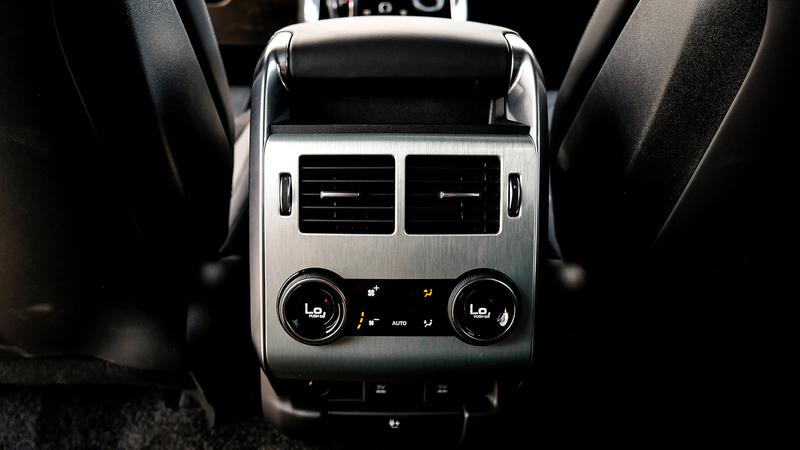 The truck can be equipped with a full suite of driver aids like high-speed automatic emergency braking, adaptive cruiser control, blind spot assist, lane keep assist, and more. On the more practical side, there's also as an advanced towing package that mirrors Ford's trailer backup system by tying the steering to a control knob and allows the driver to maneuver a trailer directly. Just as the music world eventually moved away from British-inflected rock and roll, there will come a time when you will no longer be able to walk into a dealership and drive out in anything that sounds remotely like the Range Rover Sport SVR. Jaguar-Land Rover is already thinking about how to give its electric I-Pace crossover a soundtrack worthy of the brand's heritage; listen to robo-thruster effect they're worked up and judge for yourself. Either way, thinking about the changes ahead gives the SVR a precious quality that complements its brutal nature in a strange, compelling way. The performance SUV market is a weird one. Manufacturers have stretched the term thin by filling the space with crossovers that can certainly carry a lot of things quickly but lack any of the all-terrain abilities of their ancestors. It may seem a pointless, disingenuous exercise to some, but these are undeniably popular vehicles. And think of it this way: Were it not for the competition, Land Rover never would have been forced to attempt a shotgun wedding between a trail rig and a track star. The presence of a hundred stilted hatchbacks pushed this 575-horsepower, low range-wielding Range Rover into existence, and we're all better for it. So despite its faults and and lofty price, it remains an apogee of the form. Really, its closest analog is the Mercedes-AMG G63, and that still doesn't hold a candle to the way the SVR Rangie handles on pavement or the noise it makes. I'd pick this over anything else solely for its off-road abilities even if it didn't corner like a slot car and sound like a thousand angry angels calling from on high. 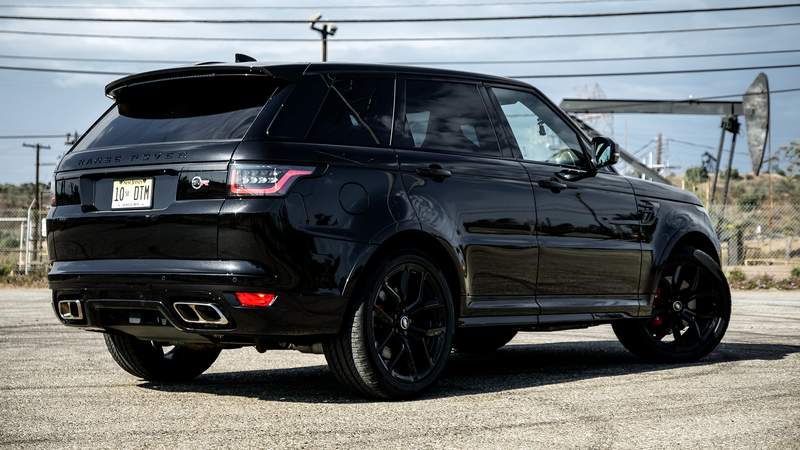 It's one of the best performance SUVs ever made, which makes it one of the best SUVs ever made. But then again, we expect nothing less from a Range Rover. On a run through New York's monied Westchester County, the Range Rover diesel fits right in. No one need know you're saving fuel—and money. 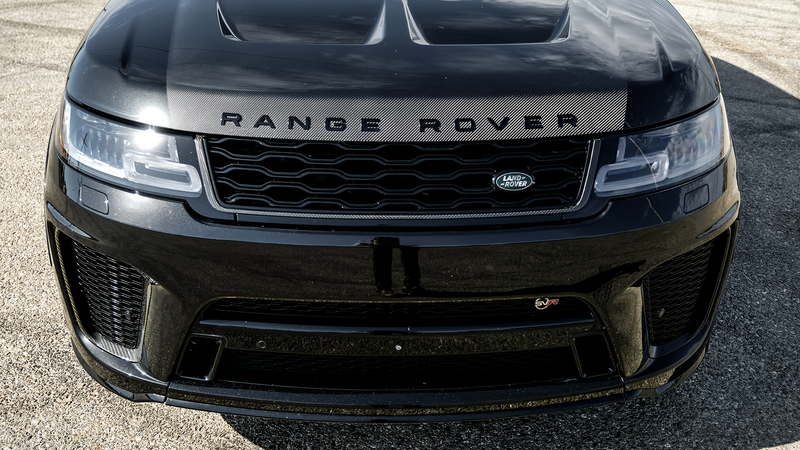 The Range Rover Sport SVR toasts the Ferrari 458's record run across the 7-mile course. High tide takes no prisoners.